Cycle for Charity 2015 raised over €2000 for Cork Simon and One Man’s Ethiopia. 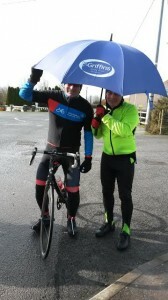 On Sunday March 1st a lot of cycle clubs and cycle enthusiasts braved the harsh weather to raise much needed funds for Corks Simon and One Mans Ethiopia. The thunderstorms, bitter winds, and pelting rain did effect the attendance of the cycle. Prior to Sunday the team at Griffin’s had hoped to raise more, but were very grateful to the hardy cyclists that did turn up to brave the elements, and cycle for charity. 100% of the money raised for The Cycle for Charity is given to the charities. Griffin’s Garden centre cover all the cost required to run this successful event. This is Griffin’s’ third year to host this cycle, and work hard to raise both money and awareness for the two charities. Every year, Granny Griffin treats each of the cyclist to her heart warming soup and homemade brown bread. Margaret Griffin would like to take this opportunity to thank all the cyclists, Red Cross team, An Garda Siochána, and the stewards, who worked hard to ensure a successful but safe cycle Demos, talks and workshops at Griffin’s. As usual, there is always something for everyone at Griffin’s. At their open day for groups in March, Griffin’s launched their great package for groups, tours and clubs for 2015 with a lovely theme of spreading a little happiness. So let Griffin’s of dripsey organise a magical day out for your Group including a Demonstration/ talk or your choice followed by a gourmet Lunch. For further details Contact Helen on 021 7334286 or info@griffinsgardencentre.ie Gardening made easy at Griffin’s. Every Saturday at 2pm you can enjoy ‘Gardening made easy @ Griffin’s’, everything from colourful rockeries to beautiful spring containers. The Secret Recipes of Granny Griffin continues every Wednesday in March. A lot of Granny Griffin’s friends and customers rate Griffin’s fish dishes as one of their best. The chefs at Griffin’s will reveal some of their favourite recipes on Wednesday March 25th. Limited space so please pre-book on 021 7334286. Celebrating those special occasions. First Holy Communion is just around the corner and the big question is whether to entertain at home or to celebrate this important day in a restaurant. Griffin’s can help you either entertain at home or in their restaurant. Griffin’s award winning restaurant is welcoming to all people. Their menu is designed to suit everyone in your party. The children (young and young at heart) can release some of energy in the outdoor playground, While everyone else can enjoy the beauty of the homestore and gardens at Griffin’s of Dripsey. If you prefer to entertaining in your home, then a visit to Griffin’s should be top of your list. Add a touch of colour and style to your home both indoors and outdoors with colourful containers, garden furniture and beautiful gifts. Also the head chef at Griffin’s can create a catering package tailored to suit your guests and budget.